Reposted with permission from Gulf News. Libya is a patchwork of tribal and regional affiliations, underpinning the social, political and economic foundation of the country. Given the number of casualties on both sides in the past six months, Libya faces a real possibility of descending into chaos, especially now the unifying slogan of bringing down Gaddafi is no longer viable. Libya has to follow the example of other countries and have an amnesty for former officials and supporters of the regime. More than two years later, and as the news of the last few months of chaos show categorically, Libya seems to, unfortunately, descend into that very fragmentations I feared then, and is reverting back, in the absence of the brute force of the Gaddafi regime, into a patchwork of tribal and regional affiliations, and even criminal networks of arms, drugs, and human trafficking gangs. The question now is why did this happen, and what needs to be done to save the country and protect its civilians from this descent into anarchy and lawlessness? 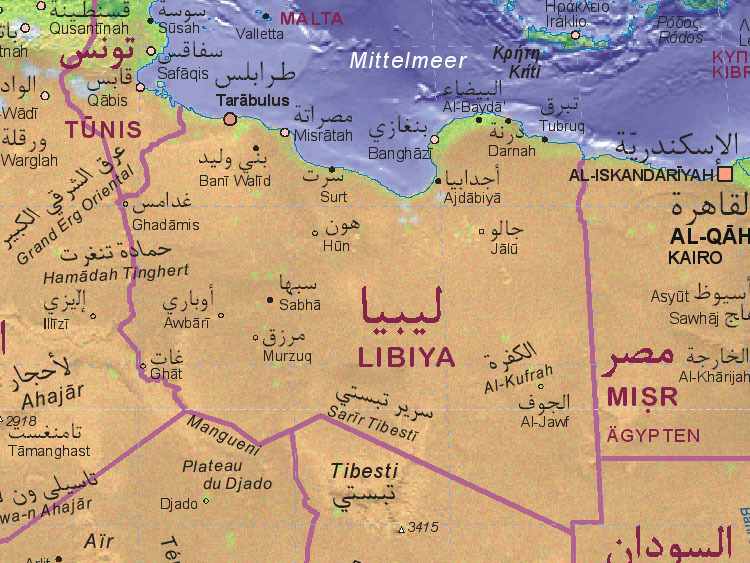 The first mistake, was the reluctance of the international community, and refusal of Libya’s rag tag army of rebels — mainly in the service of their self interest to be the only power on the ground — to plan and implement a comprehensive Disarmament, Demobilisation, and Reintegration (DDR) strategy, that would have allowed the presence of international troops on the ground to maintain law and order after the fall of the Gaddafi regime and actively work on disarming and reintegrating the armed groups that fought against him. This was a direct byproduct of the refusal to admit and recognise that the Libya conflict of 2011 was indeed a civil war between Libyans with differing political agendas. It is now obvious to most however, that without security and law and order, it is practically impossible to reach any sort of consensus or agreement between the various segments of society. The armed groups will always be able to force their will, on those who are unarmed. The second mistake was the severe lack of political capacity and leadership that resulted in utter lack of a clear strategic vision and narrative for the future of the country that can rally the support of the Libyan people, and can provide a blue print of what the country needs to do to rebuild its institutions and infrastructure and link Libya’s own interest to international help and support. The third mistake was clearly the failure of the leadership of the rebellion and uprising against Gaddafi to incorporate and reintegrate the many supporters he still had in the country. Instead, the public and official narrative institutionalised both regionalism and vindictiveness which pushed 100s of 1,000s of Gaddafi’s real and perceived supporters to flee to neighbouring countries where they still remain today full of anger, instead of bringing them into the fold and giving them a stake in the future of the country. Libya has sadly become Iraq revisited. These 3 fundamental mistakes created an environment where arms, lack of a national vision and revenge on all sides reign supreme, and where the voices of reason, national reconciliation and unity are marginalised and pushed to the periphery. First, learn from Libya’s own past during its struggle for independence in the 1940s, after the Second World War, where the allied forces of the UK, US, and France provided the security umbrella that allowed the UN, in parallel, to provide the political and technical umbrella that allowed 60 representatives of Libya’s regions to hammer out a social contract and a constitution that was the foundation of its independence in 1951. Libya today in my opinion is in no position to solve its current crises on its own without outside impartial help. Trust has broken down between regions, groups, political parties, and the government and its citizens, and no leadership seems to emerge that can provide that impartiality and credibility that is now a must. Libya needs international help again on both the security and political front, and this help needs to be international and under the UN, rather than bilateral with different countries separately. Allowing some segments of the population to own and use arms, while others are without weapons, will only produce an unsustainable political reality that will be dominated by the interests of certain groups at the expense of others. The second important step to take, is to recognise the absolute need for establishing the principles and mechanisms of “restorative justice” that relies on reconciliation and partnership as has worked in many other post-conflict countries around the world, rather than “punitive justice” that will only produce more grievances and future cycles of revenge, especially given the total lack of even the most basic pre-requests of a real justice system in the country. Finally, Libya needs to put together a vision and a plan for what Libya wants to be in 10 or 20 years from now. The first and easiest part of this should be an economic vision and strategy that will re-start the economy and offer real concrete hope and jobs for the large numbers of unemployed youth. Libya was given a historical opportunity in 2011 to build the kind of nation that not only Libyans, but all Arabs, dream of having, that opportunity is slipping fast, and Libyans must now decide, what will be their next move and which future they will choose? Hafed Al Ghwell is advisor to the Executive Director, The World Bank Group.